For the longest time I thought – and truly believed – I didn’t like gnocchi. I think it was partly because my mom ate it all the time when we were kids – but ordered us (plain) pasta – so by the time she finally offered some my way, I was pretty suspicious of the little potato pillows. They looked so foreign and bizarre. I was skeptic. So, since we’re celebrating pumpkin this week (yay!) , I decided to ditch the potatoes this round and pump these darling little dumplings with p-u-m-p-k-i-n AND manchego cheese. Manchego cheese doesn’t really have anything to do with pumpkin week, it’s just delicious and blends really well with our bright orange friend. Hooray! Now, about dressing these little guys! You have a lot of options in that department. As you can see from these photos, I originally chose a very light (but awesome!) buttery sage cheese sauce. It took about 4 minutes to cook, and really let the pumpkin flavor in the gnocchi shine. That being said, this gnocchi can certainly hold its own with a heartier sauce. I cooked the second half of our batch (this recipe makes a hefty amount of dumplings) with a rich chorizo marinara and wow – divine! No matter what sauce you choose, these petite pumpkin pillows are sure to make you a believer. 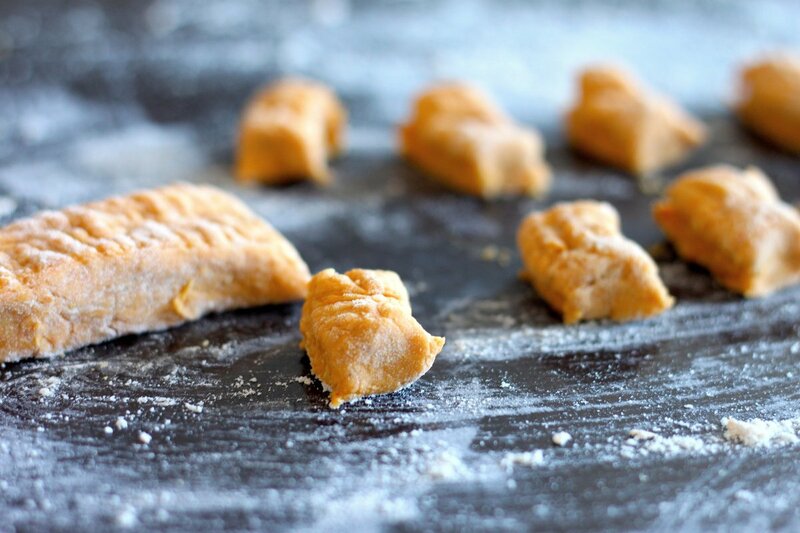 Pumpkin Manchego Gnocchi… Do it. Place the pumpkin, cheese, egg yolks, and spices in a large bowl and mix well. Add the flour to the wet mixture and gently fold – using a rubber spatula – the ingredients together until just combined. The mixture will be very shaggy. Generously flour a smooth counter top (or whatever work space you have) and turn the shaggy gnocchi mixture out; knead until smooth, but don’t over work the dough! Divide the dough into 4, then roll out each piece into a long rope about 1/2″ – 3/4″ in diameter. Cut the rope into 3/4-inch pieces. Continue with all 4 ropes. At this point you can either cook the gnocchi or place the dumplings on a sheet of wax paper and freeze until firm, then transfer to an air tight freezer bag. Bring a large, salted pot of water to a rapid boil. Add the gnocchi and cook for 3-4 minutes, or until they all float to the top of the pot. Once they come to the top, let them cook for another minute or so, then drain. Toss with sauce of choice and serve at once! Ha! I never had gnocchi until I was like 13, then tried it loved it and never had it again till last year. No idea why! It’s SO good! 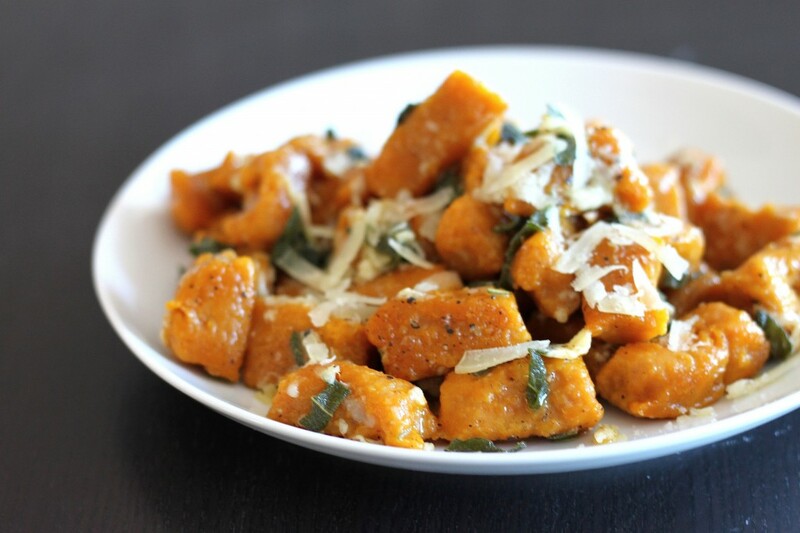 I made butternut squash gnocchi, but your pumpkin version is calling my name. YUM! What a gorgeous recipe!! I’ve never been a huge fan of gnocchi either but this doesn’t look like what I’m used to! Yay for pumpkin season! I’m ready to dive mouth first in to this! Gnocchi is one of our favorite things to eat. I love that you used a butter sage sauce to top these off – that’s perfection on a plate! Marry me. Please and thank you. This is brilliant! I love savory pumpkin dishes!! This is WONDERFUL, Ashley!!! I love it! I love gnocchi! this recipe looks amazing! I am a HUGE gnocchi fan so I know I will absolutely LOVE this dish – amazing! The first time I had gnocci was when one of my roommates made it for us on her day off. I fell in love. I love this pumpkin version, I’m definitely going to have to try it! Mmm! This looks amazing and great for fall!!! I’ve been meaning to try pumpkin in a savory dish and it’s been years since I’ve had gnocchi. This looks like such a delicious and healthful meal packed with flavor! Oh wow, what a delicious dish. I’m not a huge pumpkin fan, but this has me convinced to take another look. Love the rustic look of this dish. I have a version of this on my blog and it’s one of my favorites! Must compare. Is your dough a little sticky? Seems like I’m adding a lot of flour to mine. My other question: Where’s that chorizo marinara sister? This dough was *very sticky when I was forming the long ropes, but it still wasn’t as bad as scone dough haha. And that chorizo marinara was a beautiful mistake I must recreate asap. 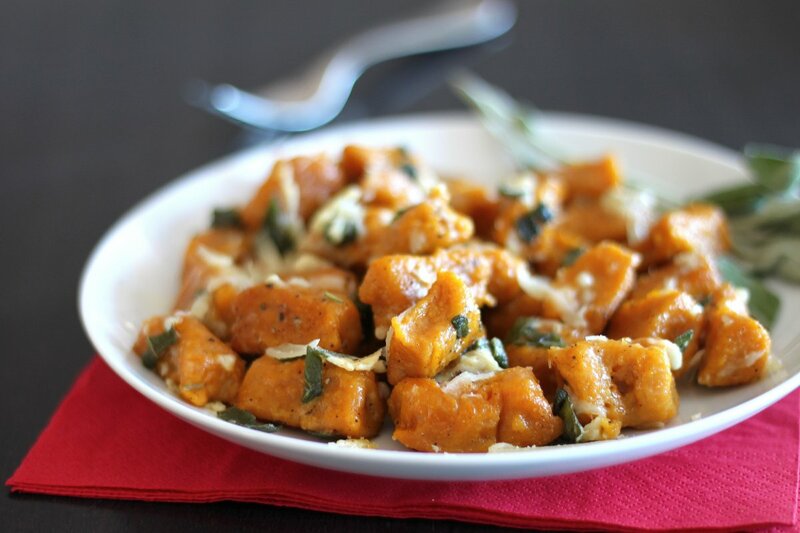 Oooh…pumpkin and sage have it goin’ on with this gnocchi recipe! Just look at those babies…sweet little dumplings. Mmm! Thanks for sharing, girl! Gnocchi is on my list of things to make.. but now you just blew my mind and am making me rethink all my hopeful recipes and move to the pumpkin dark side! YUM! 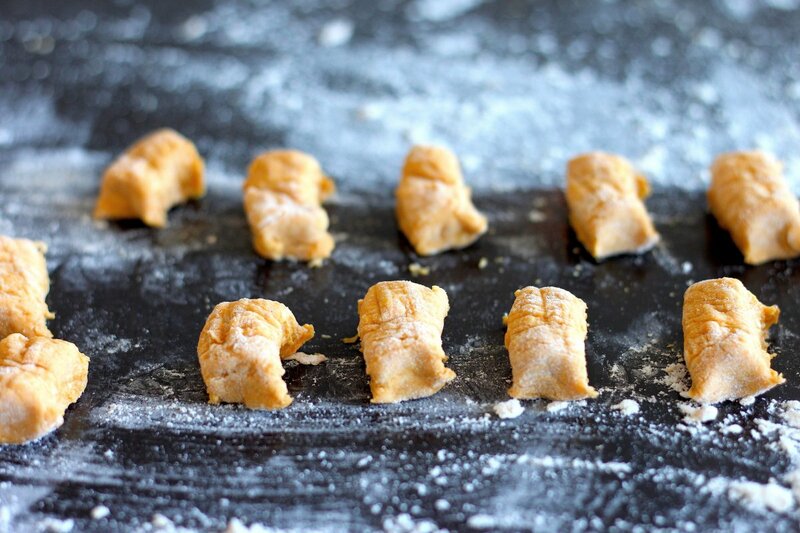 Gnocchi is definitely not something to be skeptical about….so glad you’ve seen the light. And even more glad about the pumpkin gnocchi situation. Pinned! Not only am I positive that these taste amazing, but their color is so gorgeous!!! My husband would love this and I’m also marking it down as a meal to make when I have my vegetarian friends over to dinner- it’s hard to find a sophisticated veggie meal! These guys sound so good and so easy! Certainly a step up in the ease department from the sweet potato gnocchi I’ve made in the past–that require remembering to put sweet potatoes in the oven an hour and a half before you want to eat. Why have I never thought to use canned pumpkin before? Thanks for the great idea! Oh my goodness!! 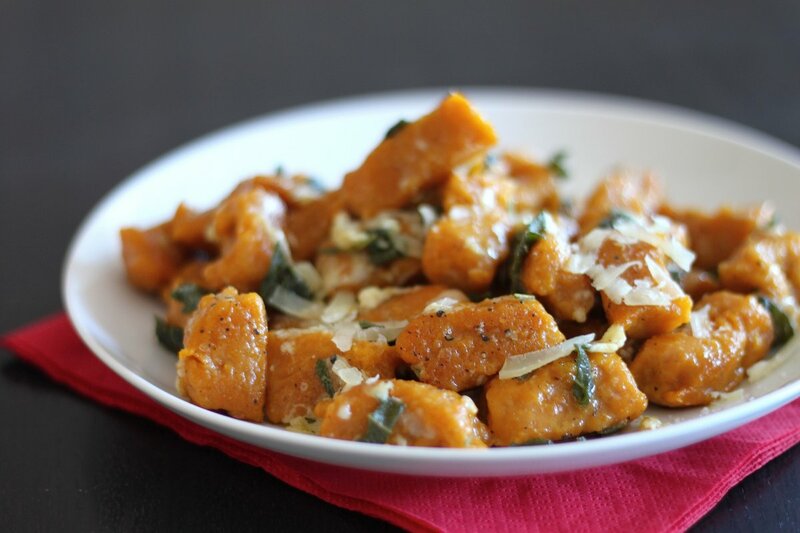 I too am not a big fan of gnocchi, but this is pumpkin version is a game changer! I was going to do this last year and didn’t. You have no idea how good this looks right now! All the best flavors of fall paired with comforting and delicious gnocchi, I love it!! I’ve made pumpkin gnocchi before, but the Manchego! That must make these amazing. They look so good! I love it!! Wonderful comfort food for this fall weather. I’m so glad you are having a pumpkin week. Don’t you just love pumpkin and sage together?! One of my favorite combos. And I am dying to hear more about this chorizo marinara lady! 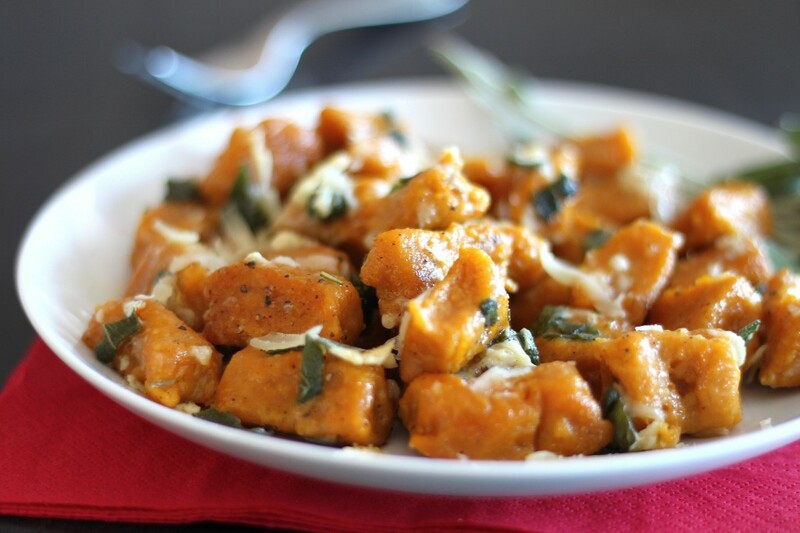 I love gnocchi, and pumpkin anything is amazing. This is the perfect fall dish! Gnocchi is the queen of all pastas, and it’s super easy to make! Bonus. I love that you made it pumpkin flavored. I came here to check out those pumpkin muffins, but got completely sidetracked by this beautiful dish! Perfect fall dish! Oh hells yes. HELLS YES. I would like to marry this gnocchi, please and thank you. Gnocchi are probably my favorite homemade pasta to make! Those little pillows are just so fabulous. Yet..I’ve never done a pumpkin variety. SHAME. I’m imagining the pumpkin manchego combo. And yes. That’s awesome. Gnocchi is one of my absolute faves and this looks like a total stunner! Love the manchego in there. Made this last night. The dough was wayyy too sticky to roll out and work with in any way I needed more like 3 cups of flour, FYI! I used to be the same way about gnocchi, but that all changed as soon as I tried it. Your story totally supports my theory that people who don’t like gnocchi just haven’t had any yet! 1/2 cup of whole wheat flour? There’s no measurement listed… Would it be alright to increase to one cup of whole wheat flour to go with the two cups of all purpose flour or would this change the consistency too much?